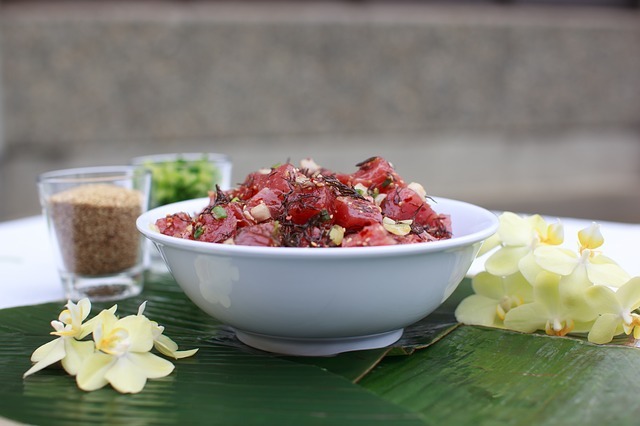 Hawaiian poke bowls showcase a healthy mix of ingredients with fresh, raw seafood as the focal point. At newly opened Poki DC, the chefs recreate this signature dish, but with a contemporary twist. Instead of serving up pre-designed bowls, they allow you to build your own as you move swiftly down an assembly line. Start by choosing a base of sushi rice, brown rice and quinoa, zucchini noodles, organic spring mix, or a combination. Then select a protein, from the classic ahi tuna to salmon or yellowtail. Add a panoply of toppings, like avocado, crabmeat salad, mango, and edamame, and a sweet or savory sauce. Toasted sesame, sriracha mayo, and honey-wasabi are among your options. Finally, toss on crunchy bits of roasted seaweed or bonito fish flakes as the final flourish.